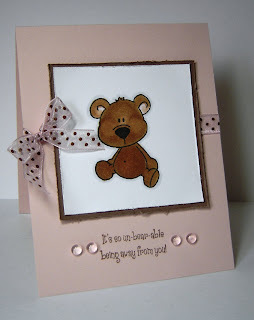 Anita Be Stampin: Bear-els of fun! I recently attended a Copic certification class and had the opportunity to learn how to *better* use my Copic markers. While I definitely would not consider myself a pro at coloring with Copics, I do recommend taking the class if you have the opportunity to do so. I learned so much and met a couple of really sweet gals as well. The "professor", Marianne was so entertaining and easygoing. If you are interested in learning Copic marker techniques, please check out Marianne's blog: http://www.ilikemarkers.blogspot.com . Now that I've seen what Copic's airbrushing system can do, I can't wait to get my hands on it. The card was inspired by the pink and brown dotted ribbon that I just can't seem to get enough of. I tend to gravitate towards this color combo when I am looking for something a bit softer. The card itself is quite simple, so I won't bore you with a long drawn out explanation. I just knew I had to try out my Copic markers on this cutie pie bear from CC Designs.